The excitement of sea trials and open house is over and we are back in Arizona with a load of photos and video to process. The link at the bottom will take you to another eight minutes of video, this time with lots of visitor comments plus a bit of action with the seas abeam and behind as well as on the nose. 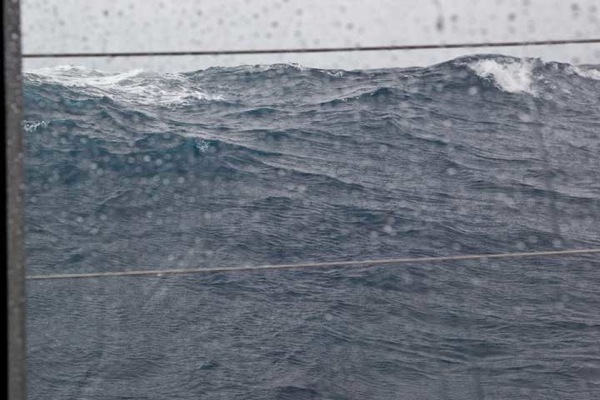 Most folks in the marine industry would rather avoid a sea state derived from three days of gale force onshore winds. We believe awful sea states are an excellent learning tool. A rough day at the office, as it were, keeps us on our toes, and our decision making process focused. To have a tolerable, or better yet enjoyable experience in these conditions, hull shape, foils, and stability curves play a part, as do scantlings. But these are in the background when you are at sea, and it is the interior layout which becomes dominant. Ease of movement, handrail placement, fiddle rails, and furniture that constrains your body if an unexpected lurch is encountered, create an environment that invites you to head offshore. Even the need for stairs, their quantity and shape play a part in this. If visitors happen to be onboard, and if they are past or present power boat owners, with real world experience, they can quickly judge the merits of the FPB approach to crossing oceans. To watch this latest (9.5 minute) video click here. There are four other videos associated with this sea trial and open house, which have been previously posted. We have collected the links to each of them below. Sea trial video number one. Light winds, moderate to light, sea state moderate. Video number one (five minutes 45 seconds) is here. The second sea trial video was filmed on the way south from the Bay of Islands to Whangarei. Off Brean Head we encountered a nasty confused patch of waves and Pete Rossin dug out his Canon C95 pocket sized still/video camera. The video is short and the waves impressive. Video two (two minutes, forty five seconds) is here. Video number three has long shots of Iron Lady heading into the steep seas off the entrance to Whangarei. Studying these sequences will give you a feel for the wave patterns, and how the FPB 64 reacts to them. This is a lot more realistic than what you take away from short clips. Video number three (seven minutes forty seconds) is here. Video four has a series of long shots, both inside and outside, upwind, with the seas abeam, and running off. Video number four (seven minutes 44 seconds) is here. This entry was posted on Saturday, October 20th, 2012 at 12:03 pm and is filed under FPB 64 Updates, FPB 64 Videos, Most Popular, Right Sidebar Latest Videos, three. Both comments and pings are currently closed. Hulls five and six are now committed and we would not be surprised to complete the sale for seven and eight in the not too distant future. My husband and I were two of the aforementioned ‘traditional trawler types.’ We arrived curious, expecting greater comfort in the mild-to-moderate conditions in which we typically find ourselves while underway… but skeptical about the amount of difference we would appreciate in more sizable seas. And let me emphasize that the conditions that day have been in no way overstated; in fact, video never seems to accurately portray the way the waves truly look. We were stunned. Astonished. Gobsmacked. We know exactly how that would have felt in a traditional trawler. At some point you slow down, just to keep your teeth from falling out. But slowing down only makes your active stabilizers less effective against the roll, not to mention prolonging the agony of the passage. Yes, our boat can handle that. But it’s unpleasant. Yet here we were, in casual conversation throughout. When standing or walking, we found only a light steadying hand hold was required. I could have cooked dinner during that sea trial… and I don’t mean cup-o-noodles, either. I’m talking about a real meal. In short, I guess you could say we got religion! Valerie, Thanks for your input! Nice to get the opinion from the owner of another ‘type’ of vessel. The lack of slamming is to be commended. Yes, there were drop-offs, and some big splashes, but no actual ’slamming’. I don’t think I saw anyone in those videos get forced forward or lose their footing. That must mean that your speed also remains very constant in those waves. (And they were messy seas). We asked Rod to look at the video and give us feedback. However, this is not easily done from a video and Rod said he could not really give any sort of an accurate answer. Wind strength was similar as was angle and location. Rod was pushing Avatar to create some drama for the photos, whereas Iron Lady was running at cruise. My guess is that there were occasional wave encounters that were similar in size on both days, at least withing a foot/30cm or so. I noticed a shot of Osprey which has two small-ish solar panels. Would it be possible to have many more such panels and develop some sort of hybrid-drive system? This would combine diesel with an electric motor (even as a get-home system) … and maybe eventually an entirely solar-powered boat. I suppose it would have battery storage instead of diesel tanks. I’m not an engineer and this may well be a dumb question which you and your experienced followers can dismiss out of hand. I’ve been looking and researching sailing yachts with which to explore the world with my wife (admiring Sundeer very much) and find myself guiltily coming back to the FPB concept. I say guiltily because I have always had the romantic notion of cruising using only wind power – free of carbon-burning, expensive and noisy oil-burning propulsion. As an avid sailor I’ve always looked at the “stink-pot” set with a mixture of derision and sorrow: they don’t know what they are missing! In these pages you make some compelling arguments to the contrary. I haven’t yet seen you address the aesthetic and modern “moral” issues surrounding using fossil fuels instead of sail. The FPB / unsailboat concept seems unique and your stature as as having been a famous sail-cruising couple carries lots of weight on the subject. Could you speak to this a little bit? … I’d be very interested in your take on that. Thanks for this site and I really appreciate your well-thought-out approaches to cruising and cruising issues. 1-Propulsion fuel for most long term cruisers is only a part of the carbon footprint. Fuel for power generation and heating/air conditioning often add up to a big chunk of the total burn. 2-Most sailors use their engines 60% or more of the time. We love to sail, had a couple of very quick passagemakers, and still used the engine 40% of the miles at sea. Going slow in light conditions is costly in terms of wear and tear on the rig and puts you at risk with weather. 3-If you were to slow an FPB 64 down to 8.5 knots your fuel burn would not be that different from a typical 65 foot sailing yacht at the same speed. 4-You could run the boat at anchor (or nearly so), excluding air conditioning, with solar power. The best solution for this would be an arch across the stern with five or six 200 watt panels. Solar would not be practical for propulsion. 5-Regarding your disdain for stinkpots, we have felt the same for at least the last 50 years. We were forced into an FPB by the combination of maturity and wanting to keep cruising on our own. Where Linda was accepting I was not, and while the design challenges were rewarding, the concept of cruising on an FPB was hard to accept. Knowing what I do today, if this were ten or 15 years ago, and I had the choice between Beowulf (water ballasted high performance ketch that was much faster than Wind Horse), or the FPB, I would chose Wind Horse. She is simply a better cruising tool. That said, whatever your choice, to be successful, it needs to make your heart sing when you look back from the dinghy.